In many ways we've been working much much harder than usual (late nights, long days, lots of manual labor): hence, the working hard. But in the midst of that, we haven't been doing the work we typically do: hence, the hardly working. Soon the new studio will be in order and we'll be back to printing - but for now, here's an update on what we've been doing in the meantime. We picked up two new-to-us desks for the studio. The first desk, for me, is a lovely warm desk with lots of drawers and just enough of a decorative feel. The second desk (for Brad/interns/friends/freelancers, etc.) is a Singer sewing table that's been turned into a desk. It's got cast iron legs, 3 drawers, and a whole lot of character. We found both desks Antique Liquidators in the South Lake Union neighborhood of Seattle. Antique Liquidators has 3 floors of amazing antique furniture - and their prices are insane. We found two desks we LOVE for about the same prices as we've been seeing on Craigslist, at estate sales, etc. And they're in pristine condition. I really love this store. They even deliver. It's definitely worth a trip. 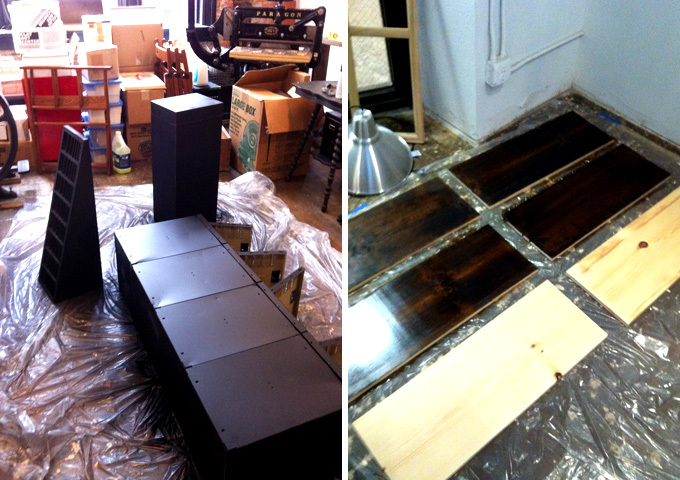 We've also been working on several DIY projects this week to get the studio ready to roll. One of our biggest needs in the new studio (and any studio, really) is storage. We've searched and searched, and most of the available options (in our price range) are unattractive or just not appropriate for a print shop. We need something sturdy, unfussy, and something that goes well with the feeling of our equipment and work. Brad stumbled upon this blog post & tutorial by The Brick House, and fell in love with their DIY plumbing pipe shelf. It's industrial and structural, yet vintage-y and poetic. So, we've embarked on our own shelving project. All the materials have been purchased, the wood stained, and we're nearly ready to build it. More photos and info to come. The black trim in our new studio (windows, baseboards, doors, etc.) is so lovely and classic - we noticed right away that several of our light colored pieces looked pale and dull next to it. A few cans of spray paint later, some of our least attractive furniture pieces (estate sale finds, etc.) are now bold and black and lovely as well. For more on what we've got planned and what's the come for our new studio, check out our Studio Inspiration board on Pinterest.